This is my first time posting here. So i dont know where should I post my problem but Peltier/TEC cooling forum seems to be the right place. If moderators feel otherwise, by all means move to the correct forum. thanks. Based on the diagram above, the heat transfer will be from the IC chips packages to the motherboard edge indicated in blue only through conduction. The IC chips will be given out almost 40 watts of energy each. Therefore my guess is that at card edge, the total energy output will be around 100watts. Am i correct to say that?? The chips junction temps will be at around 100degC at full load. Therefore am i correct to say that, the card edge will also increase to around that temp if there is not other heat transfer path from the card edge and no way of removing the heat out of the card?? 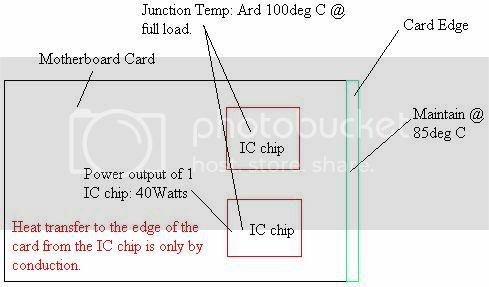 Now I am required to maintain the card edge at 85degC when the IC chips are powered at full load (the IC chip power output is rated at 40W each).. to do this, i will be using Thermoelectric technology (is there any other method that is easier to do and achieve?). Therefore the question here is, is there any TEC modules that can help me do that?? help me maintain the card edge at 85degC. Because normally people are using TEC modules to cool their stuff around room temperature.. but mine is around 85degC for the cold side of the TEC (which in fact is like doing heating up operation instead of the normal cooling operation). So if i understand, the hot side will be higher than 85degC. Is it correct to say that? Furthermore, since my heat source power output is at 100W at the card edge, can i say that I need a TEC module with power rating of more than 100W?? Can i use an underrated (less than 100degC but enough to maintain the card edge temp at 85degC) TEC module?? I assume my ambient temp = 20degC. therefore Tamb = 20. Therefore Th = 20 + (112.52*0.311) = 54.995degC. Hence the hot side temp will be at 54.995degC (lower than the cold side temp) <--- weird!!! since delta Temp = Th - Tc = 54.995 - 85 = -35degC (negative sign) <--- weird!!! Anyone able to clarify the calculations? I am abit confused already. Another question is if this can be done, what are the likely specs of the TEC will be? 2) heat to be absorbed from the cold side. 4) voltage drawn by the TEC. Is it true?? if it is true, what other parameters must I look out for? which shows the performance of a TEC module based on voltage, current and heat energy. So can I take a normal TEC module which is what i want and then just adjust the voltage or current that i input into the TEC module to change the power rating of the TEC module so that I can adjust the temp accordingly. Can i do that just by controlling the current or the voltage which the above weblink seem like indicating? Cause from the link, based on my opinion, by adjusting the current or voltage, you are shifting your operating point around those curves shown in the link which correspond to different power rating of the same TEC module. Am i correct to say that? Thanks in advance. Your inputs will be greatly appreciated. Re: Question on thermoelectric cooler design. What happens at the motherboard edge? Is there a big heat sink there? What is the air flow there like (CFM) and at what temperature is it? "Maintaining at 85 degrees" is not useful info when ambient is ???? TEC's are useful only when you want to cool smallish loads to sub-ambient temps. Transmission of heat is only the thickness of the Peltier = less than 5mm. You've got a load small enough, but no desire for sub ambient temps. You've got a fair distance you wish to move the energy. Given an assumption of ambient in a server in a air-conditioned data centre of 30Â°C, you've got a massive delta-T to work with (at 85Â°C) and such a small heat load. What's wrong with an aluminium heatsink and fan? If you want to get fancy and you have a hard ceiling temp, why not heat pipe(s)? ohh ya. the ambient temp will b around room temp of 25degC-30degC. Anyway why do you think the delta-T is massive and i have a small heat load? Cause to me, isnt the heat load = to the heat output by the card edge which also = 100W?? Correct me if i am wrong. You say by using an aluminium heatsink with forced convection, is it able to obtain the card edge at 85degC easily?? but if I go for the heatsink combination, is it possible to constantly maintain at 85degC?? I believe a temperature controller is required. Ohh one last thing, thanks for your inputs. Could you run it at a lower temperature?